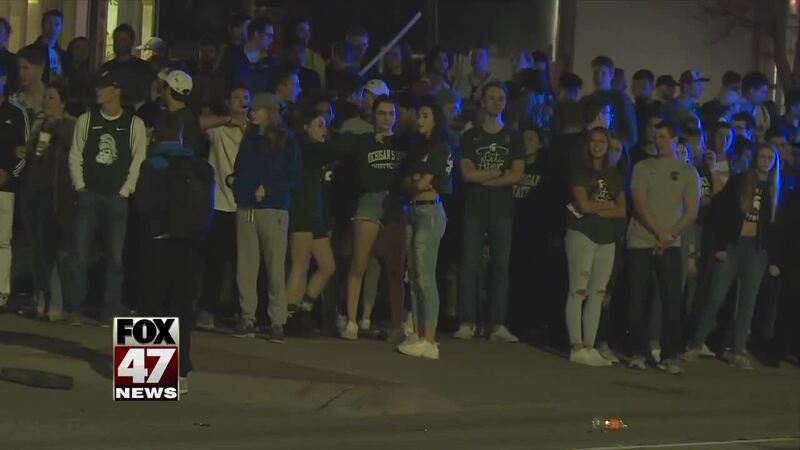 More than 20 arrests in one night may seem like a lot for East Lansing, but police are telling us it's right in line with past Final Four weekends. EAST LANSING, Mich. — More than 20 arrests in one night may seem like a lot for East Lansing, but police are telling us it's right in line with past Final Four weekends. The East Lansing Police Department says Saturday night was actually calmer than they were expecting. The deputy chief attributes that to being prepared. "We saw like 60 troopers here set up. They had the helicopters going, and it was a little bit slow, we lost, we were feeling a little bit depressed," MSU senior Marino Merlini said. There were 22 misdemeanors, one felony, ten fires, a damaged police van, and two damaged signs from Saturday night. At one time there were about 1,500 people gathered on Grand River Ave. chanting, some throwing bottles. But police say they were able to keep it under control. "We actually expected larger-sized crowds, history tells us that crowds start to gather and just because it was a late game, the weather was perfect on Saturday, and we expected a lot more people to come out," Deputy Cheif Steve Gonzalez said. Gonzalez says as the team gets further into the tournament, the department starts to plan. This includes asking for assistance from surrounding departments, which made up the 200 police officers patrolling the streets. Many were dressed in riot gear, which is to protect them if things got out of hand. "We did have some officers hit with a bottle, one officer was hit in the helmet with a bottle, but those are preventative measures, we're not going to let our officers stand out in a crowd like that unprotected." Despite the incidents, police say the preparation and warning students of consequences paid off. "Short of the team not advancing to the final game, I think it was a success. Ideally, we would like to not have any property damage occur, but overall with what we saw that night...it was a good success," he said. Most of the arrests were for disorderly conduct or open alcohol in public. The one felony was for the damaged police vehicle. Police tell us they made two arrests the previous weekend after MSU beat Duke.